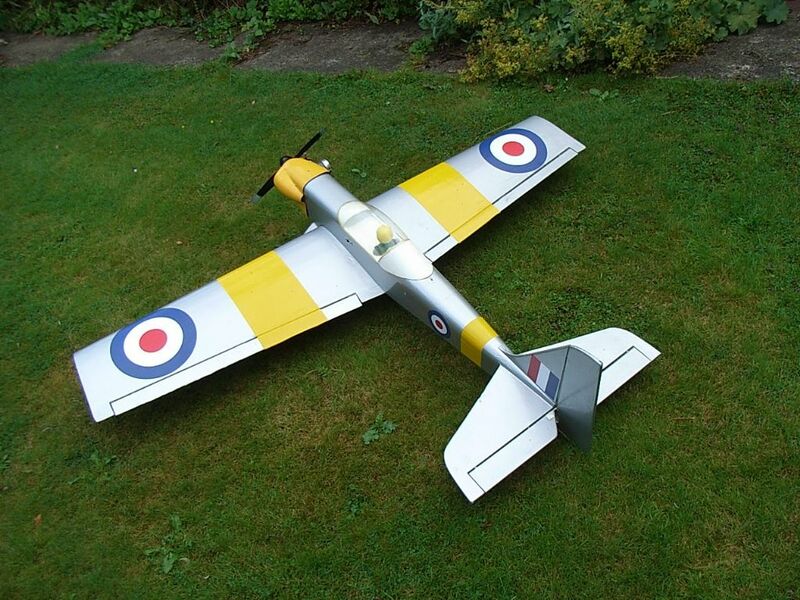 I have decided on an OS65AX & 14x6 prop with a 10 oz fuel tank (I hope big enough for decent flying time? ), What spinner size are people using? Also does this need standard size servos? 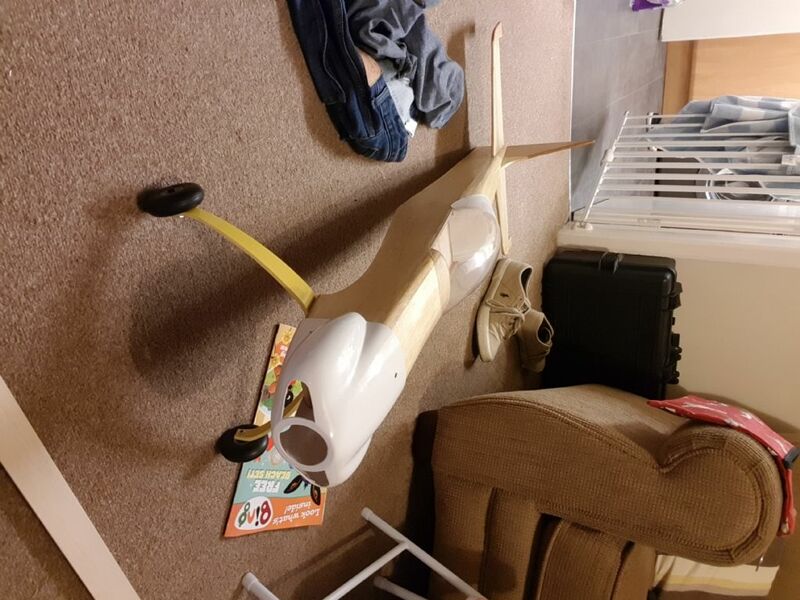 Sorry for the basic questions but its my first build and non foam rc plane! And as i understand i will need to epoxy the fibreglass sheet to join the wings together, then just film over the rest of the plane? hello mike and welcome from me.fit a spinner to suit the dia of the front cowling(off the top of my head 1.1/2--2" .use a wing joining kit which will include a bandage for the joint.film will be fine for the model,use standard size servos(Futaba 148's-cheap and reliable)before you fit the top front deck to the model use any spare wing joining tape and some resin(do both at the same time-wing and undercarriage mounting area) with some reinforcement ready for some heavy landings..... hope that's clear for you.... if not ask as many questions as you want. ken Anderson...ne...1 A/Wot kit dept. Just a thought. A 65 ax for a new flyer may be on the powerful side do you have anything smaller ? Thanks very much for the advise! I think i may be too late by the sounds of it depending on what you mean by top deck, as I've completed most of the fuselage. Ill take some pictures when i get home so you know where i am in the build process. & Thank you i really appreciate your help I'm sure ill have many more questions! No mate I've pulled the trigger on this already! ken Anderson...ne..1 ....beefed up dept. I agree with Ken's suggestion of reinforcing the inside of the fuel tank bay and the firewall. Yes the model accepts standard servos but I think it would be way overpowered with a 65ax - in my model ten years ago I had a 55ax and that was more than enough. The bigger engine will make the model heavier and therefore it will have a faster landing speed/higher stall speed. It's a great model and I am sure you will enjoy it! I Love the Acrowot and have my sixth kit in the garage ready to start. Definitely agree on reinforcing the tank bay floor / U/C mount area. Even if you have completed your fuz build you can still get at the area through the tank access in the former - bit fiddly, but perfectly doable. I've used a variety of engines over my association with this plane. First one had a Magnum 45 Pro in it, flew fine but really needed a pipe to perform. I later tried an OS 70 Surpass, 4 stroke, but I had that one painted by a mate who gets a great finish. I didn't appreciate, up to that point, just how heavy paint can be and this, coupled with the weight of the engine, made it my least successful one. I recall Chris Foss suggests putting a spar in the tailplane of the Wot 4 if you are fitting a big engine, but I don't know of any AcroWot tailplane failures myself. As far as covering, I'd be happy with filming the wings, but I prefer either glass cloth or nylon for the fuz, as they do add a bit of strength you don't get with film. Good luck with it, it's a great design and a super sport model. My only bit of advice would be that seeing as this is your first non-foamy model and it's likely to have considerably more performance and weight than you might have been used to, I'd have an experienced flyer take it up to trim it out and allow you settle in with it at height with lower power settings. Give yourself ten minutes with it though and you'll be away. Explore it's flight envelope over several flights without rushing things and you'll have a superb model that will give you plenty of fun. Cuban 8 is spot on there- I credit the Acrowot with really teaching me to fly - sure, I'd become competent on a Tyro Major, Student and Wot 4, but I only really got it when I did exactly as he describes. 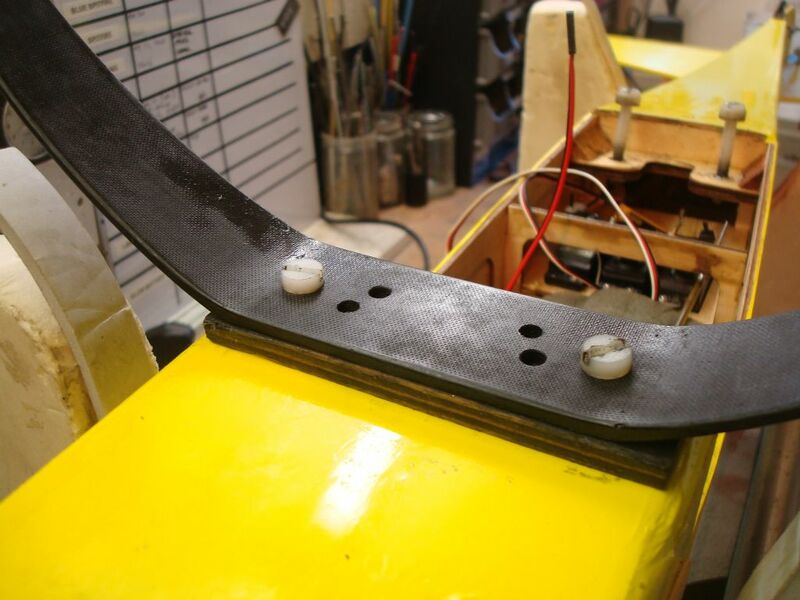 So now, whenever I build a foam wing in fact, I epoxy the cores together, and line out the servo box, but then, before I apply the glass bandage, I sink a balsa sub-spar, maybe 1/8" or 3/16" thick and about 3" long right into the wing from the top about 2" back from the leading edge. It doesn't matter if you slice right right through the wing and slot it in full depth, the idea is to tie the top and bottom skins to the rear of the wing dowels. Once set and sanded to fit I apply the wing bandage. Then when I fit the dowels I make sure I drill through the LE and the Sub spar, and I haven't had a dowel come loose since. If you are really fussy, some people drill the LE and spar out slightly over size and fit tubes, so dowels can be replaced easily if necessary. On the subject of easy repairs I am not a supporter of nylon U/C bolts - sure, they may save you ripping the tank bay floor out, but they may also fail when the structure otherwise would not have done, which usually results in a more awkward repair where the wheels have gone through the bottom of the wing. Make sure you add plenty of shape and lightness by not skimping on the shaping of the fuz too - the Acrowot is not such a job in this area of some of the old pattern ships, but it's still an area where a bit of weight can be saved, and lighter is better! never give great confidence in being the ideal anchor for them, liberal use of epoxy or not. Never personally had a failing nylon bolt in all but the heaviest 'arrival', which is why we use them. of the most enjoyable parts of building. Yep - watching an aeroplane shape emerge from a log is indeed one of the most satisfying bits, although it does tend to make a bit of a mess..Nearly got to that stage with my PB Bullet myself. I guess nylon v metal U/C bolts is a bit like whether to steer your noseleg or not - Marmite issues you have one view or the other on. Never built one of Galaxy's offerings but I would have thought that ply would be a bit OTT, scrap balsa works just fine for me. Hi all, sorry for the late reply! Just a quick update. So I've used fibre cloth and e-poxy to cover the fuselage. My next task is to try and reinforce the undercarriage. Where i orderd the OS65 they didn't have stock so i have canceled the order as per suggestions and i will order the 55 later on. 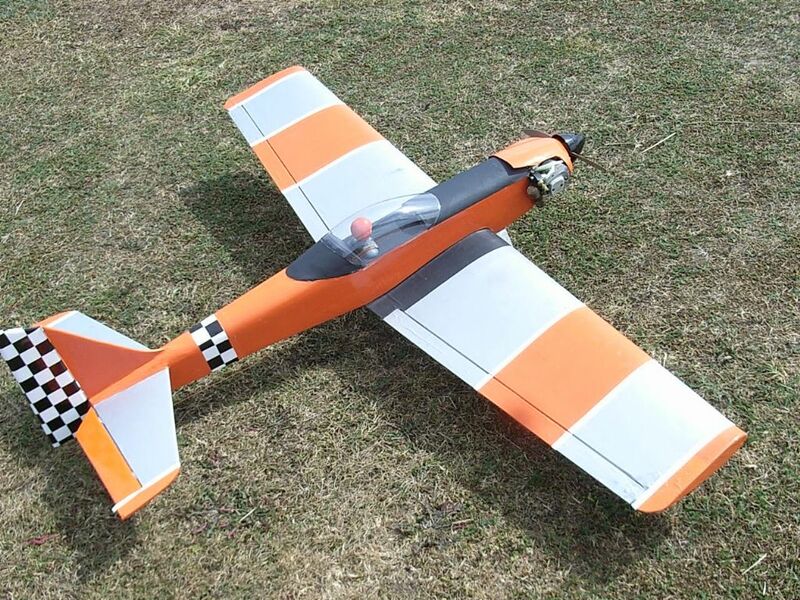 Also on servos are the Futaba 148s plenty adequate for this plane then? 3.0kg and 0.22 seconds? Since i have epode the plane is it easier to paint it now? if so how would i get rid of the gaps where the hinges are on the control surfaces? And thanks For the Suggestions also Tim ill reinforce the dowels in the wings when i get to it! Ok thanks Ken really appreciate it! i have just ordered the servos so should get them Tuesday, the fuel tank came Friday as well so ill look at that later! Cheers ill try and keep the gaps minimal then if i can to save adding the tape if it won't make that much difference anyway! Heres the Acro Wot so far! 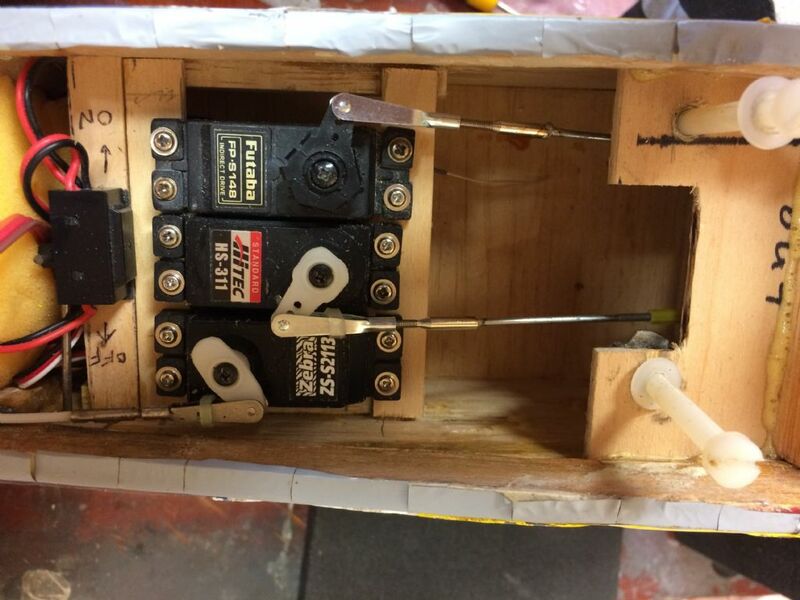 Does anyone have any photos inside of the servos and the tail section where the rod/wires get to the rudder/elevator that i can see please? One aspect of the Acro Wot which has not been raised in this thread is its ability to fly slowly. I've had two of these, both of them bought second hand. I fitted several engines to them but my favourite was the OS 61SF. They flew beautifully but they both met their end through me landing them too quickly on a grass strip. In both cases, the undercarriage took out the F2 former, then the wings came off and took the servo mounting plate with it. Quite extensive repairs were required! I gave the silver one to a friend who has never repaired it, but then again, he has one in flying condition. Rest assured they will fly very slowly on landing approach and loosing the undercarriage was entirely my fault. I must buy another kit next time I'm back in England. Pictures of my two examples below. 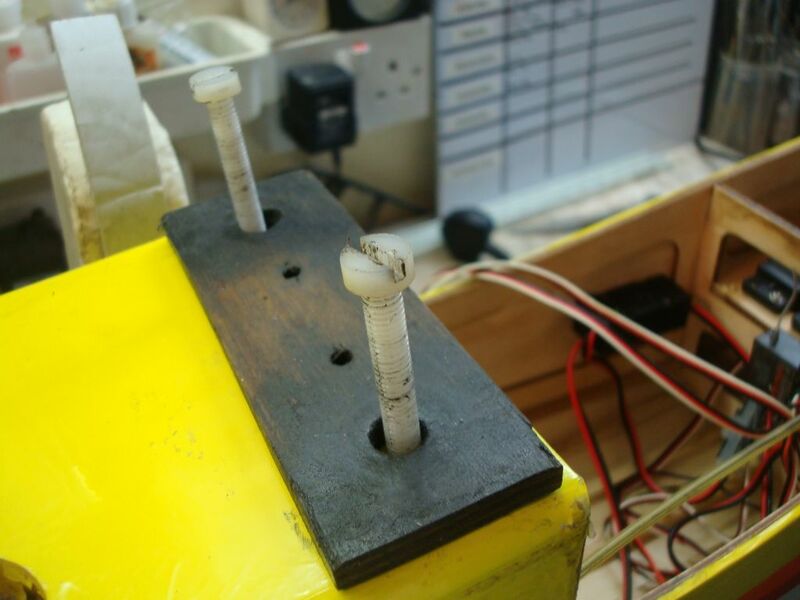 These photos show a mod I have been doing to all my Acro wots and other similar models, most of our club also do this now. By replacing the the blind nuts with 6mm ones and using plastic bolts I have not torn out the bottom of this acro wot and fly it most weeks. 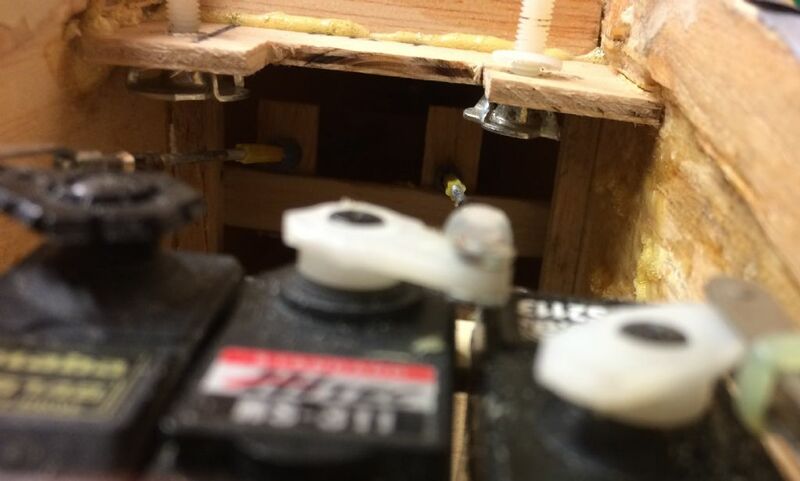 The ply plate makes sure that when you break the bolts that there is enough bolt to be able to get out easily. I buy the bolts in bulk but it is better than trying to glue the plate back on when fuel soaked. Here are some photos of my much flown, much crashed and much re-built version. It came to me second hand, I think its about 20 years old, it has a single central(ish) servo in the wing and off-set aileron torque rods (to match the off-set wings and tail), hence the offset cut out in the wing retention plate. I don't know how much help this is, mine has snakes instead of push rods, these were installed by a previous owner, I don't know why, I don't think there is anything wrong with push rods in this model. It still flies well despite its extra weight and slightly asymmetric build.